The original church organ was built by the Delaware Organ Company of Tonawanda, New York, and dedicated in concerts by John Grady (then organist of Holy Family and Saint Patrick's Cathedral) and Pierre Cochereau of Notre Dame in Paris. The present instrument, built by Robert M. Turner in 1996, employs most of the original pipework in a vastly different and enlarged design. The organ was dedicated in a concert given by Daniel Roth, titular organist of Saint Sulpice in Paris. In keeping with the multinational family that constitutes the parish, the organ is an eclectic instrument, drawing inspiration from noted organs of several centuries and traditions. The work of the late G. Donald Harrison was a major source of inspiration. Several stops were built following his practice and some reedwork came frm his early masterpiece originally in the Harvard Chapel, Cambridge, Massachusetts. 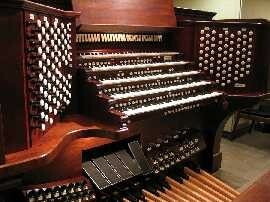 The Positiv division, in the sanctuary, was built by the Wicks Organ Company and installed in 1999. The five-manual console uses solid state combination and coupling systems. The exterior case is of Honduran mahogany with solid raised paneling for the sides and back. The interior wood is Peruvian walnut.